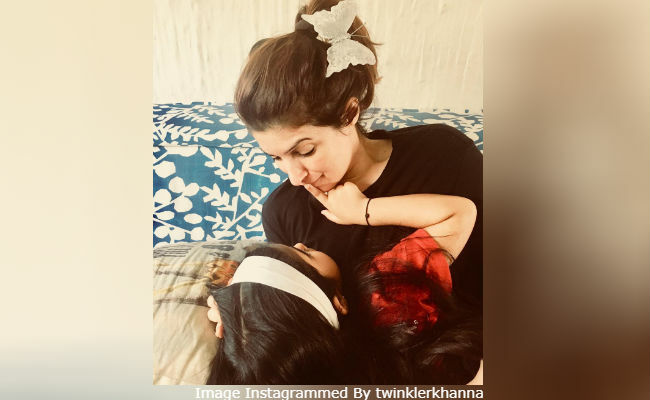 Twinkle Khanna and Akshay Kumar's six-year-old daughter Nitara found two adorable stray puppies and she now wants to adopt them. Twinkle shared a cute video of Nitara playing with the puppies in their garden and wrote, "The baby finds two strays, brings them home and is now insisting they become part of our family," adding the hashtag 'doggy cuddles.' In the video, little Nitara, dressed in a grey tracksuit, is seen holding one of the puppies and plays with them. The post has been liked by celebs like Sonam Kapoor, Neha Dhupia, Malaika Arora, Kriti Sanon, Sonali Bendre, Mira Rajput, Namrata Shirodkar and others. Namrata also commented and wrote, "It's never a bad idea." To which, Twinkle replied, "Would love to. Just waiting to see if my old dog Cleo starts getting aggressive with these two around. That would make it difficult." On Nitara's sixth birthday in September, Akshay posted this. Akshay Kumar, 51, and Twinke Khanna, 43, married in 2001. Aarav and Nitara are their two children. Aarav studies abroad while Nitara stays with her parents in Mumbai. Akshay Kumar's next film is 2.0. He also has Housefull 4 and Mission Mangal in the pipeline. Twinkle Khanna recently launched her third book - Pyjamas Are Forgiving.